As we all know that women are always like to purchase beautiful winter outfits from sale offer. Today we are going to share upto 50% Off price on all winter items by J.JaJ. Winter Clearance sale offer. Junaid Jamshed popularity in whole world this brand is getting huge profit from their customers. 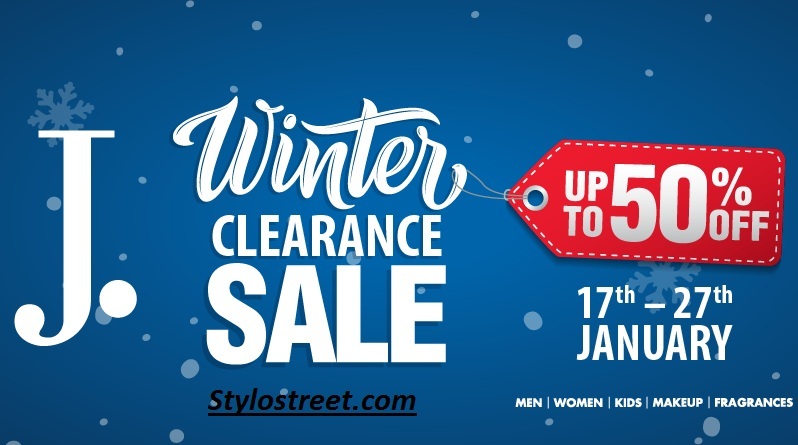 Now here we providing J.Jamshed winter Clearance Sale offer upto 50% off price on Men’s wear, Women wear, luxury winter prints and other beautiful collections. J. Junaid Jamshed winter clearance sale is starting from 16 January 2019. Today visit your nearest Junaid Jmashed shop or shop online all winter items upto 50% Discount price. Furthermore, this winter clearance sale valid on all stock including makeup and fragrances. Moreover, you can easily get free delivery for all the orders above Rs.1500/- Junaid Jamshed winter clearance expiry date is Sunday, January 27, 2019.